Most casual viewers, or non-fans give Japanese monster movies, and their SPX techniques a good ribbing because of the unreality present. Regardless of how fake Suitmation may be to some, the literal blood, sweat and tears shed by the actors inside those bulky, uncomfortable rubber suits was most definitely a reality. They often suffered hardships, injuries, and life-threatening hazards while performing these roles of monsters and aliens from other worlds that have entertained generations for over 60 years now. This two part article covers a handful of famous and relatively unknown actors that made their names inside monster suits, and a number of the hard-working technicians who built them. Inarguably the single most famous man to play a giant monster is actor-stuntman, Haruo Nakajima. Generally, when fans think of Suitmation, it's difficult to do so without an image of Nakajima as Godzilla entering ones mind. Destroying miniature sets while inside a 200+ pound suit, the energetic and athletic actor played the iconic Japanese atomic beast from 1954 to 1972 for a total of 12 performances. He joined Toho in 1950. Among his classmates in the studio acting classes he attended were future fellow suit actor Shoichi Hirose and future big name star Tetsura Tamba. After performing stunts in EAGLE OF THE PACIFIC (1953), Nakajima's road to Godzilla was paved. Having intended to play the role till he was 50, he vacated the role permanently in 1972 with GODZILLA VS. GIGAN as his monster suit swan song at 43 years of age. Coupled with the death of Eiji Tsuburaya, the restructuring of Toho, paired with diminishing box office returns, Nakajima was ready to call it quits; then came the downsizing within the studio ranks. The studio did find work for Nakajima around the lot, though; whether it was the Toho bowling alley, or managing their mahjong parlor. Indulging in a bit of nostalgia, Haruo "Mr. Godzilla" Nakajima put the costume back on one last time for a Japanese magazine photo shoot in 1983 (see insert at right). Godzilla's most famous player occasionally appeared "out of character" as an actor in these movies, as well as television shows like ULTRAMAN (episodes 25 and 33). His autobiography, 'Monster Life: Haruo Nakajima, the Original Godzilla Actor' was released in July of 2010. He got a star on the Hollywood Walk of Fame on April 11th, 2011. His fire-breathing alter ego received his own star in 2004. 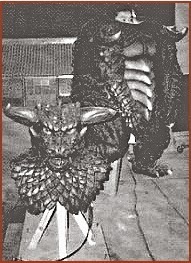 With all the potential hazards involved in wearing one of these heavy latex rubber suits (in later years, the designers were able to lighten the load, so to speak), Nakajima co-opted kaiju suit duties with Katsumi Tezuka. 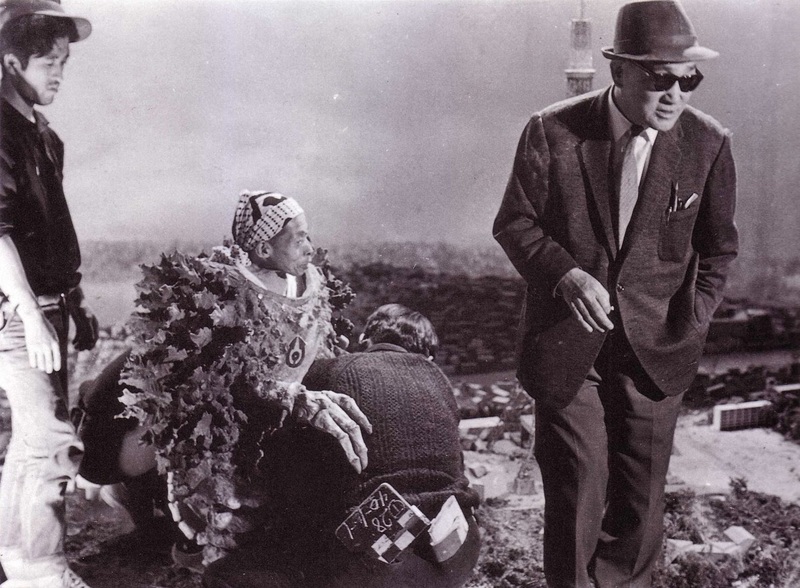 As fainting spells and extreme heat proved immense obstacles for suit actors (not to mention painful injuries and near-death experiences), Tezuka was unable to maneuver inside the costume to the degree of Nakajima because of the heaviness of the suit. With Tezuka's assist, this gave Nakajima a well deserved break in between suit-induced fatigue sessions. Tezuka (at far right in above photo) had better success inside the lighter Anguirus (Angilas/Angorus) latex suit in GODZILLA RAIDS AGAIN (1955). In between his G tenure, Nakajima portrayed other rubber suit kaiju, and even found time to wedge in some small screen giants, too. As documented in Steve Ryfle's essential book 'Japan's Favorite Mon-star', Nakajima only played the giant lizard for two scenes in SON OF GODZILLA (1967). 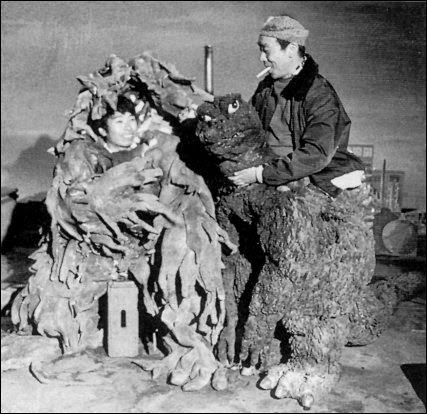 Since the suit was a larger design than normal, a taller actor, Seiji Onaka, was tapped to play the Big G. However, an accident that left Onaka with a broken hand crushed his turn at playing Godzilla, so Nakajima's kaiju suit colleague, Hiroshi Sekita (above left), took over from there. Both Sekita and Nakajima had done the Tokyo Tango in WAR OF THE GARGANTUAS (1966) as Sanda and Gaira respectively. Speaking of which, Nakajima counts WAR OF THE GARGANTUAS (1966) as his favorite suit acting role of his career. Sekita, yet another athlete and martial artist, played opposite Nakajima's Godzilla and Kong as both Ebirah in GODZILLA VS. 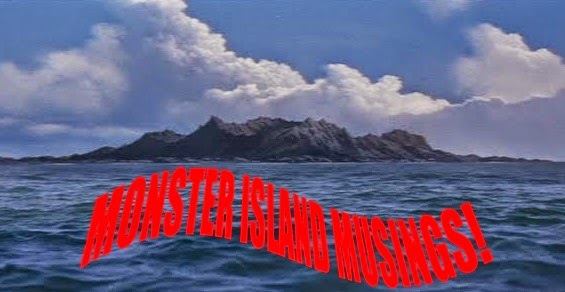 THE SEA MONSTER (1966), and Mechani-Kong in KING KONG ESCAPES (1967) respectively. 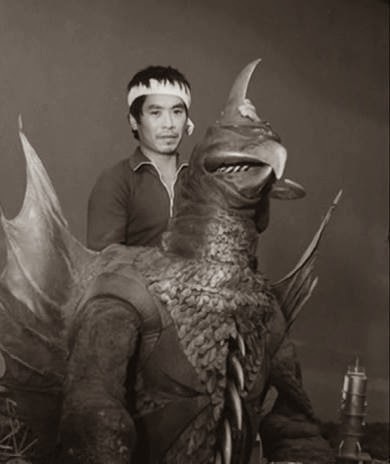 Hiroshi Sekita finished out his kaiju career as Anguirus in DESTROY ALL MONSTERS (1968) and one of the giant bat men in LATITUDE ZERO (1969). 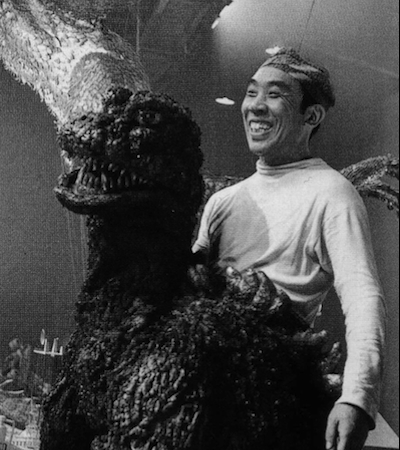 Nakajima considered him the best of the suit actors assigned to roughhouse with his Godzilla. 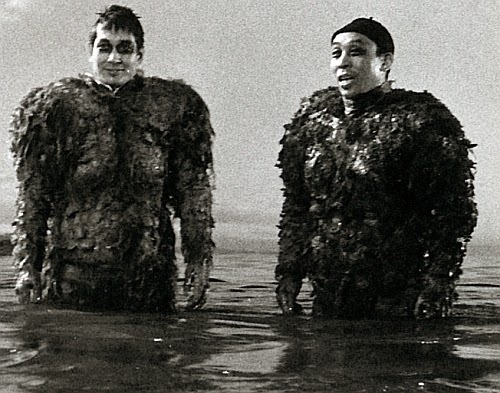 Additional suit actors that worked with Haruo Nakajima in assorted Toho monster battles in albeit brief monster suit careers were Shoichi Hirose (above left) and Masaka Minohara (above right). The former is most famous for playing King Kong and King Ghidorah (G3HM). A stunt where both Nakajima and Hirose plummet into the sea while in costume during the ending of KING KONG VS. GODZILLA (1962) was a near fatal one. Prior to this, Hirose played a Meganulon in RODAN (1956). Like Hirose, the latter only played monsters on a couple of occasions. Minohara was inside one of the MATANGO (1963) mushroom monster costumes, and portrayed Rodan in MONSTER ZERO (1965). He retired from movies in 1971. 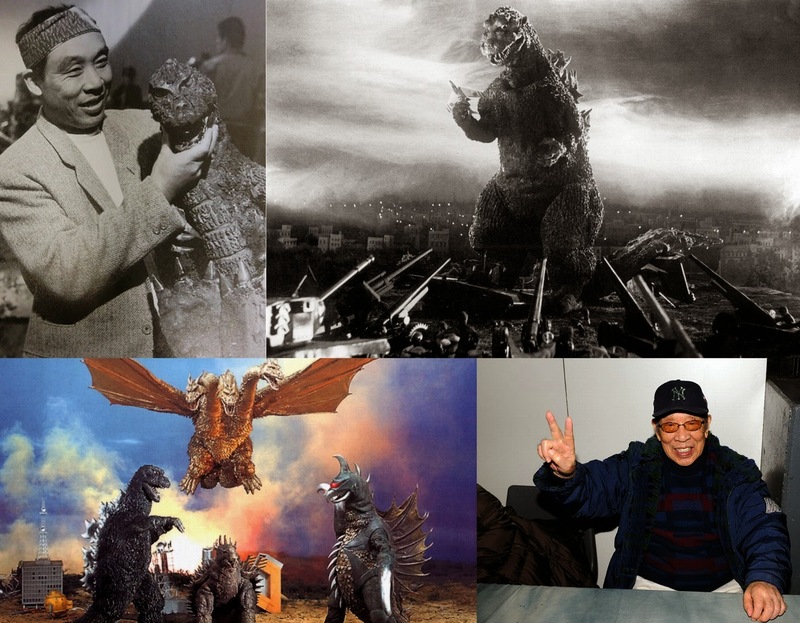 Both men played in many of Toho's science fiction and monster pictures as human characters. Fuminori Ohashi (also went by the name of Sagara Sanshiro) is an unusual participant in Japan's SPX legacy and its celebrated tradition of suitmation. Not only did he perform inside of monster costumes, but he helped design them, too. He's also unique among his colleagues in that he's honed his craft overseas. After opening his own company in 1951, he reportedly worked among the art staff at Disneyland building various props for two years prior to its landmark opening in 1955. In the late 1960s, Ohashi furthered his experience working with Anglo film production crews on YOU ONLY LIVE TWICE (1967) and PLANET OF THE APES (1968). Going back to Japan in 1954, Ohashi helped in the creation of the iconic Godzilla. The following year, he aided in the construction of the Abominable Snowman suit for Toho's banned HALF HUMAN (1955). Not only working on the effects, but artist Ohashi played the part of the monster as well (see insert photo). Going back even further, Fuminori Ohashi had modeled, and played the giant ape in the lost Japanese monster movie, KING KONG APPEARS IN EDO (1938). Unfortunately, Ohashi's last credited work is Toei's atrocious JAWS (1975) clone, LEGEND OF DINOSAURS AND MONSTER BIRDS (1977). He died in 1989. Ota Ri-ai is special amongst the suit performers in Japanese cinema; special in that it was a rare occasion that a woman played a kaiju in a film. The movie was Shusuke Kaneko's GODZILLA, MOTHRA, KING GHIDORAH: GIANT MONSTER ALL-OUT ATTACK (2001). 23 years old at the time, Ota played the role of Baragon, the first of the three Earth monsters to go claw-to-claw with Godzilla. Her height of just under 5ft. was ideal for the role. Prior to her stint in suits, she had work dressed up as characters like Robocon and Sailor Moon at amusement parks and in commercials. Prior to Ota, TEAM HANDY action team founder Yumi Kameyama portrayed Gyaos in Kaneko's reinvention of the Gamera series with GAMERA: THE GUARDIAN OF THE UNIVERSE (1995). Kameyama is cited as the first time a woman played a giant monster in a daikaiju production. One of the most bizarre looking Japanese giant monsters ever devised was Garamon; as first seen in the B/W SciFi series ULTRA Q (1966). The creature was played by a little known midget actor named Minoru Takahashi in episodes 13 and 16. At just 3'7" tall, Takahashi was said to have had major difficulties performing underneath the rubber costume. 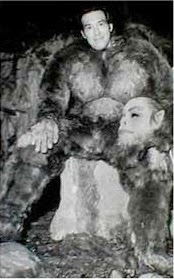 When the character was ported over to ULTRAMAN (1966-1967), his name was changed to Pigmon, and he was shrunk down to human size. A Child actor named Fujita Shuji played Pigmon in episode 8; and eleven year old Masahiro Oyaki (Hiroshi Chiba) got the chance to live out every kids dream when he got to play the monster in episode 37. Appealing with the small-fry set, Pigmon was very popular with children in Japan, and maintains a minor cult following overseas. In later years, Pigmon's popularity was assured upon his revival for later Ultra series. Another midget monster suit actor was dancer, comedian, Masao Fukasawa (Machan). He was 46 years old when he got the role of Minya (Minira/Minilla) in SON OF GODZILLA (1967). He reprised the role in DESTROY ALL MONSTERS (1968) and GODZILLA'S REVENGE (1969). He appeared as an alien in the 'Assassin from Outer Space' episode of the bizarre SciFi-Mystery series 10-4, 10-10 (1972). It was a reunion of sorts since Ishiro Honda directed the episode. At 65 years of age, he was also among the cast (that included Kenpachiro Satsuma) on the North Korean monster fantasy PULGASARI (1985). There Fukasawa played a baby version of the title creature (see insert). He died in 2000. Prior to the 1980s, the molding of Japanese monster suits was anything but simple -- especially for the poor souls who would end up wearing the end result. A hand-made approach was taken in building a better beast from the ground up. For Toho's initial GODZILLA (1954), nothing quite like it had ever been attempted in Japan at that time. 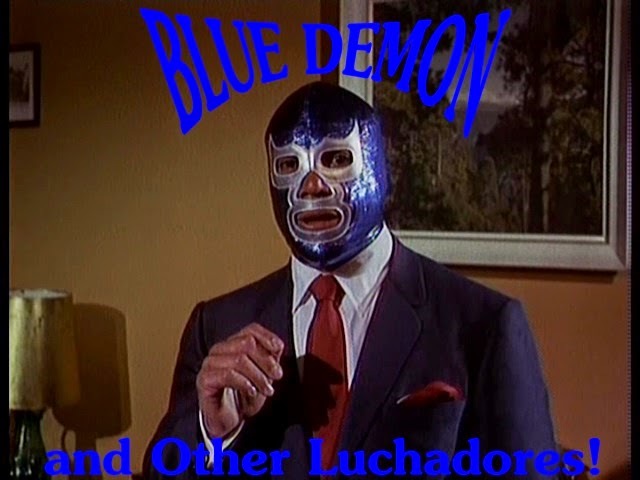 Toho was definitely rolling the dice on this story of monster mayhem. The initial designs of Godzilla from Kazuyoshi Abe had a humanoid appearance and were rejected (see above). 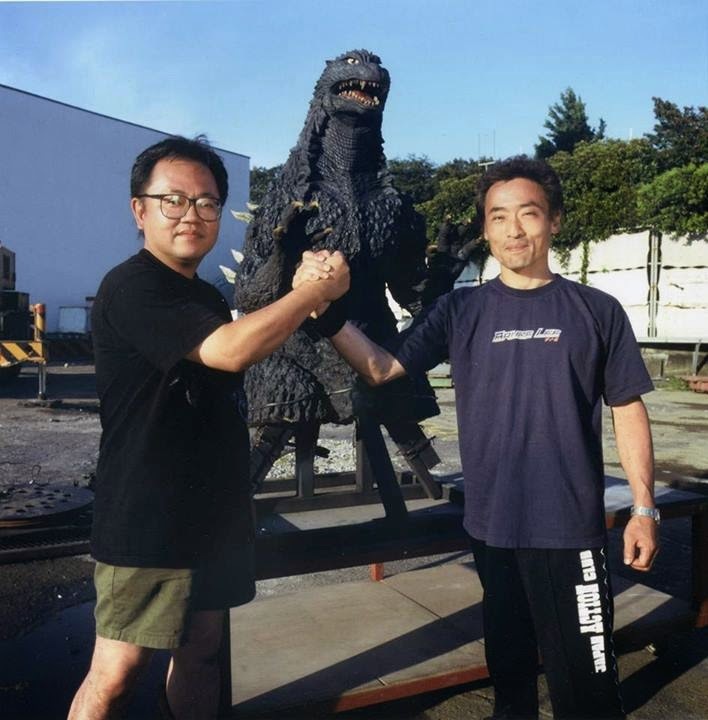 Monster modeler Toshimitsu Teizo (see left) and art director Akira Watanabe reverted to dinosaur books and articles on prehistory for inspiration. For the mighty monster, an interior frame was made using bamboo and wire. A steel mesh padded with cloth was laid over the frame. Latex was melted and covered over what would eventually take shape as Godzilla. From there, a rubber coating was applied. Depressions were made in the suit where more latex was added to represent Godzilla's mottled, scaly hide. According to Haruo Nakajima, this first suit -- coming in at just 220 pounds -- was nearly impossible to move around in, so a second suit was fashioned. As for that first suit made of molten rubber and metal, it was cut in half -- adding suspenders so that the suit actor could move much easier during shots not requiring the full body. As the 80s dawned, the methods used to build the suits would change. By this time, body part molds were made from wood and wire framed plasters. Each body part was then cast separately in foam, and pieced together afterward. By 1989, the suit building methods became even more advanced with lighter suits making it much easier for actors to coordinate movements inside of them. Veteran suit maker, Nobuyuki Yasumaru's first job was miniatures on MOTHRA (1961) when he joined Toho in 1961. 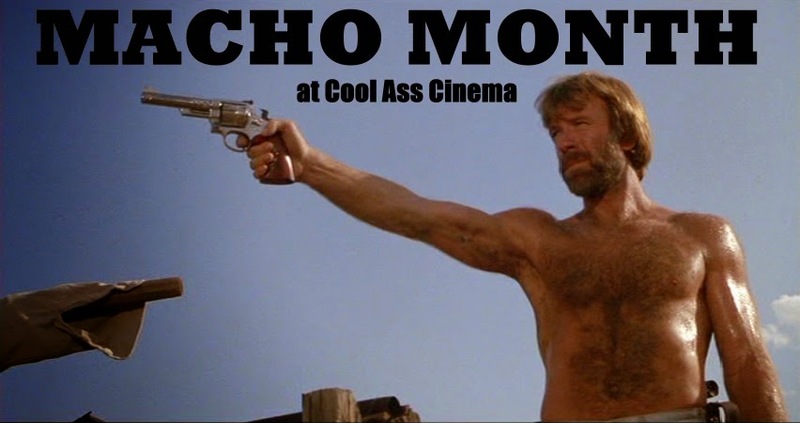 He apparently made a name for himself in 1967 while working on KING KONG ESCAPES. Dissatisfied with the progress of noted suit maker Ryosaku Takamura's Gorosaurus suit, Yasumaru took over and did one of his own design. His Anguirus suit for DAM (1968) was made of sterner stuff, and supposedly required little to no repair for its reuse in two more G films. When Toshimitsu Teizo left the field in 1971, Yasumaru took over. He remained the molding director till 1991 when his own protege, Tomomi Kobayashi took the mantle. Yasumaru was instrumental in bridging the old style with the new style. For BIOLLANTE (1989), Yasumaru introduced a fearsome new look for Godzilla who now had two rows of sharp chompers and a big moveable tongue. More movements in the head added even greater realism. Upon his retirement in '91, Yasumaru became a sculptor. Going back to Godzilla, a few other actors played the King of the Monsters after Haruo Nakajima called it a day in 1972; but there's one man whose popularity mirrored that of his predecessor. Kenpachiro Satsuma took up the mantle left over by Nakajima as Godzilla's heir apparent. He trampled miniature cities, battled monsters, and endured potentially life-ending hazards through seven Godzilla pictures -- eight if you include the 3D amusement park attraction, 'Monster Planet Godzilla'. Despite the obstacles inherent in that line of work, and much like his famous antecedent, Satsuma was extremely passionate about his role. 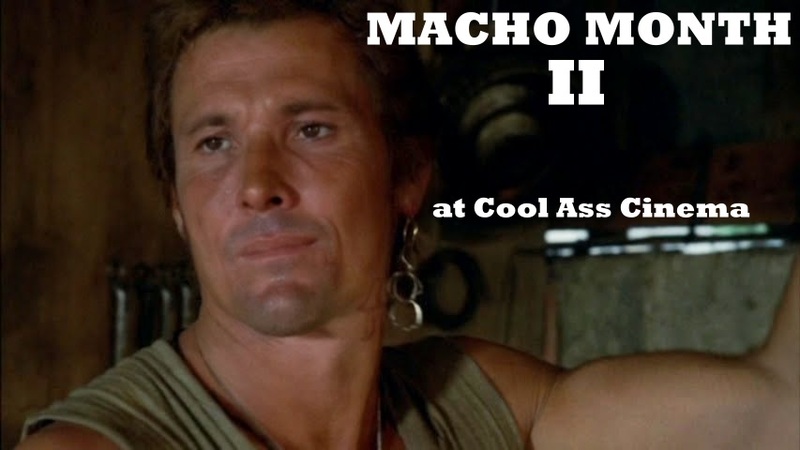 Like many of his contemporaries, he was athletic, and acted in human roles before making the move into the monster suit medium. In the late 60s, he was a Nikkatsu contract actor before moving to Mifune Productions in 1970 where he went under the name Kengo Nakayama. He soon found a home at Toho where his first kaiju role came in the form of Hedorah (sludge) for the giant monster ick-fest, GODZILLA VS. HEDORAH (1971). The new suit actor in town found it incredibly arduous acting under so much latex. According to Satsuma, the Hedorah suit was of a reasonable weight till the effects crew continued adding to it, culminating in a massive costume that weighed in excess of 300 pounds. 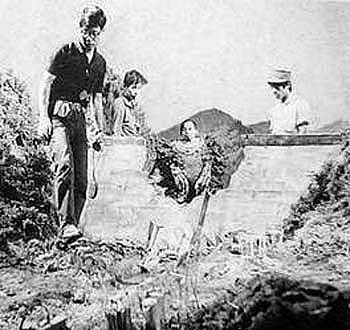 No doubt Haruo Nakajima (who was underneath the Godzilla suit in this one) could empathize with Satsuma's initial difficulties. 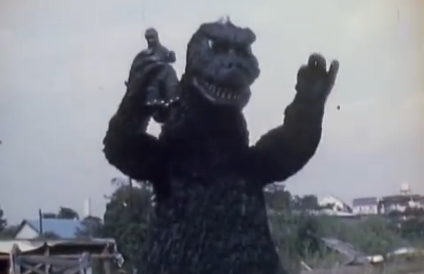 This was the first of two times Satsuma dueled with Nakajima, the other being GODZILLA VS. GIGAN (1972). A little over ten years later, Satsuma's date with destiny occurred when he landed the iconic role for GODZILLA (1984). Despite having experience acting inside a rubber suit, Satsuma found himself overwhelmed by the difficulties inside Noboyuki Yasumaru's suit. Alleging it to be over 245 pounds, by the time the actor accepted the role of Godzilla in GODZILLA VS. BIOLLANTE in 1989, the suit was a far more reasonable 180 pounds. Kenpachiro Satsuma remained in the Godzilla role till 1995s GODZILLA VS. DESTROYER. He sent the mighty lizard out to sea, retiring from suit acting. It would be a few more years before another suit performer would take on the role of Godzilla. 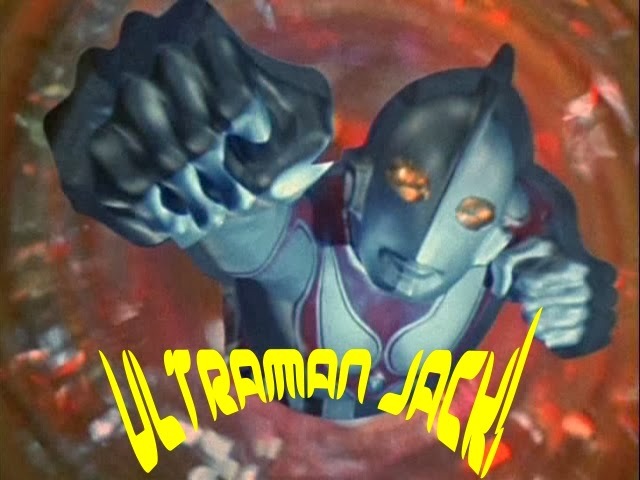 As for his other credits, Satsuma had background parts in Tsuburaya series in the early 70s. 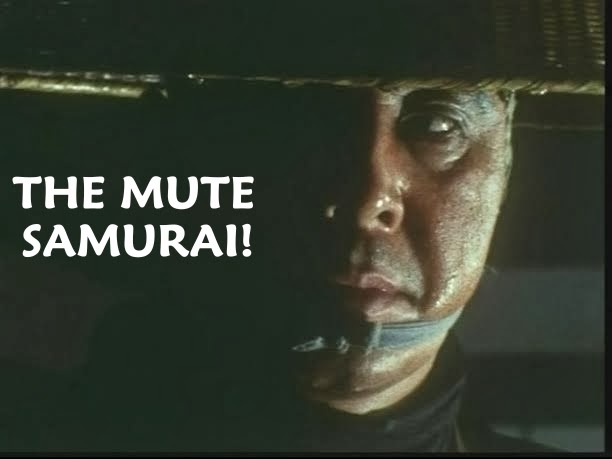 He acted in samurai movies both before, and in between his Showa and Heisei motion picture periods. In 1985, he played the title monster in the North Korean period monster mash, PULGASARI. Just prior to his last role as Godzilla in 1995, he undertook the role of the eight-headed Yamata no Orochi in Toho's fantasy spectacle, YAMATO TAKERU (1994). 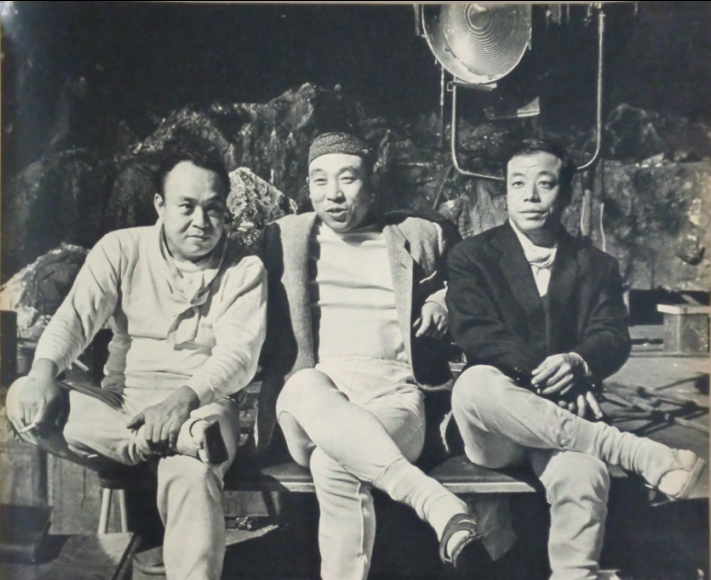 Tsutomu Kitagawa (at right; suit maker Shinichi Wakasa at left) is the third generation of Godzilla performers -- Nakajima the Showa; Satsuma the Heisei; and Kitagawa the Millennium Godzilla. A gymnast in high school, the 5'2" martial artist joined Sonny Chiba's JAC (Japan Action Club; it became Japan Action Enterprises in 2001) in the 1970s and was mentored by guys like Kenji Oba (real name Kenji Takahashi) and Junichi Haruta. Kitagawa acted as stuntman in numerous Super Sentai shows (beginning with AKUMAIZER 3 in 1975), and participated in a large number of film productions. It wasn't until the late 90s that Kitagawa began his Toho tenure first as King Ghidorah in 1998s MOTHRA 3: KING GHIDORAH ATTACKS. He then inherited the G crown in 1999s GODZILLA 2000: MILLENNIUM, and wore the much more mobile monster suit for all the Millennium series save for GODZILLA, MOTHRA, KING GHIDORAH: GIANT MONSTER ALL-OUT ATTACK (2002). The small screen had its own industry of suitmation, and actors playing giant monsters and heroic aliens from other galaxies. 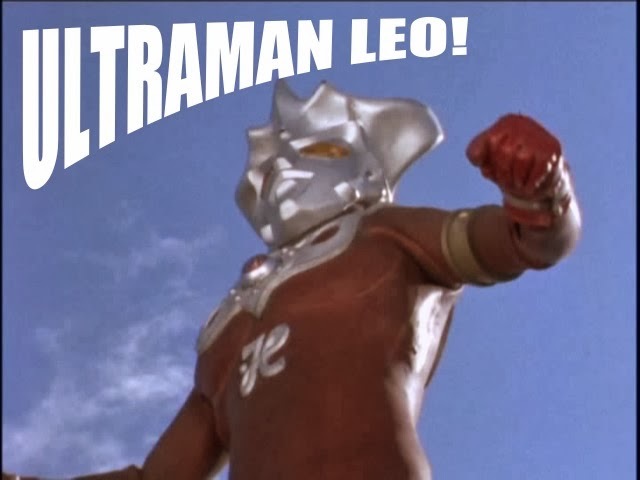 The most popular of these was undoubtedly ULTRAMAN, the brainchild of the master of Japanese special effects, Eiji Tsuburaya.